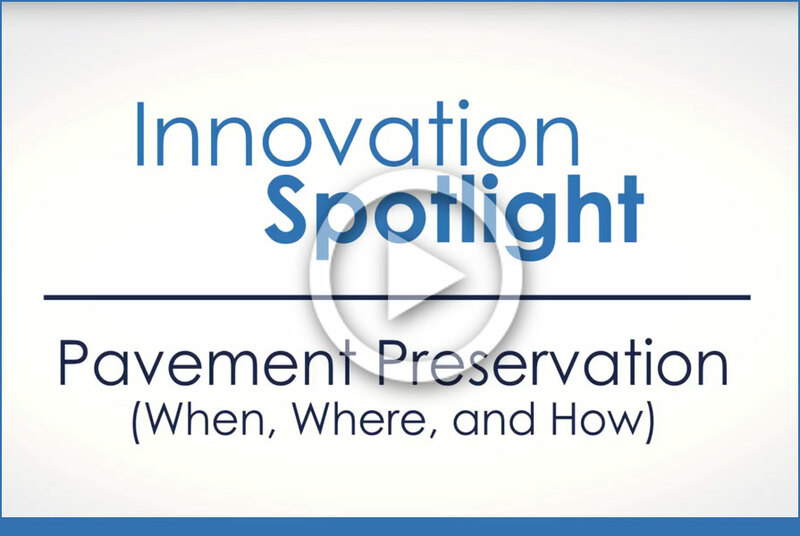 The Every Day Counts (EDC) innovation of the month for September is pavement preservation (when, where, and how), a whole-life approach to extending the service life of pavement networks. Applying a pavement preservation treatment at the right time (when) on the right project (where) with quality materials and construction (how) is a critical investment strategy for optimizing infrastructure performance. In EDC round four (EDC-4), 16 States and the U.S. Virgin Islands plan to demonstrate and assess the “when and where” component of pavement preservation. Another 27 States and Federal Lands Highway (FLH) expect to make it a standard practice to manage pavements proactively to preserve highway investments. For information and technical assistance on the “when and where” component of pavement preservation, contact Thomas Van or Steve Gaj of the Federal Highway Administration Office of Infrastructure. For information and technical assistance on the “how” component of pavement preservation, contact James Gray of the FHWA Office of Infrastructure. Bellevue, WA, has installed adaptive signal control technology (ASCT) at all of the city’s more than 200 intersections over the past 6 years. ASCT uses real-time traffic data to adjust the timing of lights to accommodate changing traffic patterns and ease congestion. In the first year after installation, ASCT reduced delays on NE 8th Avenue by 43 percent near 112th Street and 35 percent on the east side of I-405. ASCT has also streamlined left turns in Bellevue, saving 166,000 hours of traffic delays in 2014. For information, contact Fred Liang of the Bellevue Transportation Department. Stakeholders reviewed progress on traffic incident management (TIM) responder training and using data to improve TIM at Wisconsin’s Traffic Incident Management Enhancement Coalition meeting. Nearly 32 percent of first responders have been trained in techniques to clear incidents safely and quickly. The goal is to train 40 percent by May 2018. The State is meeting TIM performance goals to clear 90 percent of intermediate incidents in 2 hours and 80 percent of major incidents in 4 hours. The Wisconsin Department of Transportation (WisDOT) performance scorecard indicates the average clearance time of 78 minutes in 2016 is one of the lowest in 6 years. For information, contact Marquis Young of WisDOT. The West Virginia Division of Highways (WVDOH) is partnering with the West Virginia State Police to add TIM training to the police agency’s cadet basic training curriculum. The partnership will help West Virginia reach a goal of training 100 percent of responders in TIM techniques and enhance safety for travelers and responders. So far, 28 percent have been trained. WVDOH is developing a TIM database to track training statistics and assist in improving incident response times. For information, contact Ryan Satterfield of WVDOH. Federal Lands Highway (FLH) used construction manager/general contractor delivery on a project to repair stone retaining walls on a historic section of Blue Ridge Parkway in Alleghany County, NC, allowing the contractor to provide input on innovative approaches. The resulting project combined existing stone with geosynthetic reinforced soil construction to maintain the visual and historic character of the walls while enhancing safety. FLH used prefabricated bridge elements and systems on a pedestrian bridge at Wolf Trap National Park in Vienna, VA, to minimize work over a busy toll road and improve safety. Each of the three prefabricated steel truss spans with fiberglass-reinforced polymer deck panels was erected in one night. For information, contact Maria Rosa of FLH. 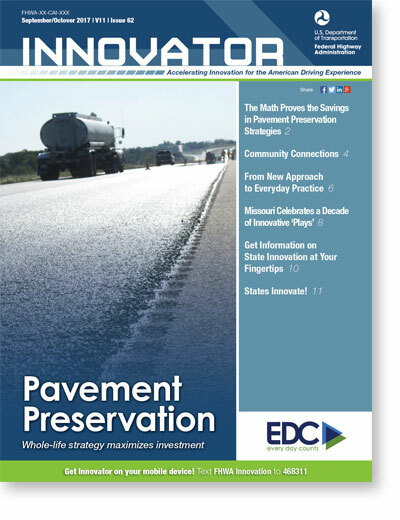 Read the new issue of the Innovator newsletter to learn how pavement preservation can save money and play a key role in the whole-life approach to infrastructure investment. Also, read how community connections strategies can turn aging infrastructure into opportunities to revitalize communities and how State Transportation Innovation Council Incentive projects are making new approaches everyday practice in Connecticut, Utah, and Vermont. Sign up to receive EDC News and Innovator newsletters.